Not the best lighting in my house to really get a picture of how delicious this looked and tasted. I'm a little late getting this one up because we actually made it last Sunday. Don't know why I'm just now blogging about it because I swear I've told everyone I've seen this week about this dish and how awesome it is! I might have even told a complete stranger...I'm just saying, this thing is G-O-O-D! So here's the run down. Of course you can follow the link to the real source: Two Timin' Pasta Bake or I'll just give you the 411 since it's so easy I've already memorized this bad boy. * Boil one box of penne pasta while you preheat your oven to 350. * In a bowl mix together (1) jar of marinara sauce and (1) jar of Alfredo sauce. * Add to the sauce mixture 2 cups of Mozzarella cheese and mix together. 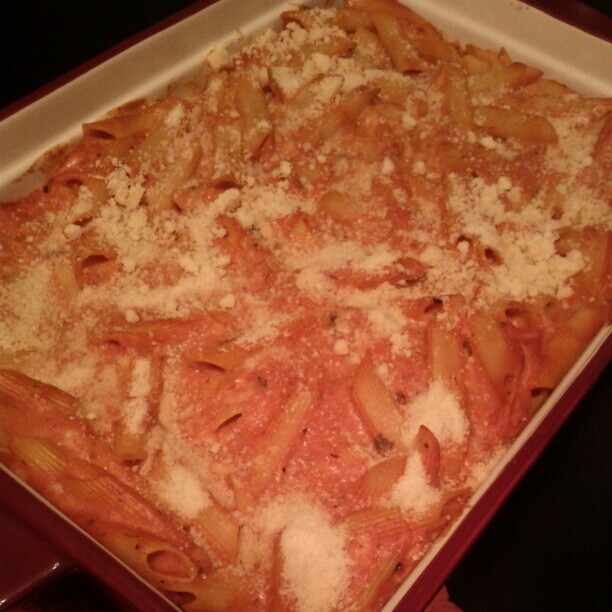 * After penne is done, drain it and toss it into the sauce mix, stir together and get it all nice and coated. * Dump into a 9x13 pan, pop in oven for 20 minutes, pull out sprinkle with Parmesan cheese and put back in for 5 minutes. I'm telling you it was that easy and to die for. So quick, so simple. Totally fits my 5 ingredient, 30 minute rule. * Would make a excellent freezer meal. So if it's just 2 of you, bake half, dump the other half in a zip lock bag and freeze. * EVERYONE in the family liked it! None, seriously, I can't tell you one thing that was wrong with it. Chris didn't even say he wished it had meat. None, this thing is the picture of culinary perfection in my home. Yes! Yes! Yes! I'm already planning on taking it to the carbo-load party our running group is having before my first Half Marathon in a couple of weeks and so help me the next time we feed the missionaries or a meal calendar comes around at church this is what I am making/bringing. I don't see anyone NOT liking this meal. It's awesome! Serve with some salad and garlic toast and it's better than going out to an Italian restaurant. So far I would have to say, this is a definite keeper. It's going on a note card and being added to the meal rotation. I also think it's going to be a perfect week day meal cause I can prep it during nap time and then just pop it into the oven 30 minutes before daddy gets home and look like a domestic goddess.